The 45CC Headphone Test Fixture is for dual-channel testing of headphones and headsets, and it is built on our vast experience in the field. With a focus on multiple configuration options and accurate and repeatable test results, the test fixture can easily be adapted to many different headphone/headset designs and sizes. All adjustments to headband position and height as well as the distance between the ear plates can be done quickly and very accurately. Precise scales make it easy to document all settings accurately, be it the headband position, the width between ears, or the position of the positioning guide. Therefore it is easy to set up other 45CCs to mirror the original setup. Once the test fixture has been adjusted to fit a certain headphone, the design of headband holder, ear plates and the unique positioning system ensures that when testing identical headphones you will get the same positioning and fit from one test to the next. Therefore repeatability in a production line testing environment will be second to none with the 45CC. This makes the 45CC the unrivalled choice for demanding Quality Control and Production Line applications, but can also be used for Research and Development. GRAS 45CC Headphone Test Fixture configured with 1/2" externally polarized or prepolarized microphones is primarily intended as a tool for Quality Control and Production Line testing of headphones. 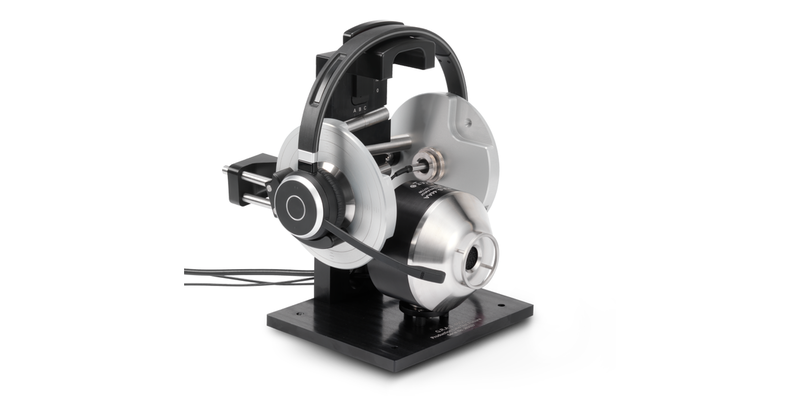 GRAS 45CC Headphone Test Fixture configured with IEC60318-1 ear simulators and 1/2" externally polarized or prepolarized microphones is primarily intended as a tool for Quality Control and Production Line testing of headphones. Where the acoustical load from an ear simulator is required, the use of the ear simulators also means that testing according to IEC 60318-1, IEC60268-7 and ITU-T Rec. P.57 is possible. GRAS 45CC Headphone Test Fixture configured with 1/2" externally polarized or prepolarized microphones and the GRAS 44AA Mouth Simulator is primarily intended as a tool for Quality Control and Production Line testing of communication headsets. GRAS 45CC Headphone Test Fixture configured with IEC60318-1 ear simulators, 1/2" externally polarized or prepolarized microphones and the GRAS 44AA Mouth Simulator is primarily intended as a tool for Quality Control in R&D and Production Line testing of communication headsets. GRAS 45CC Headphone Test Fixture configured with 1/4" externally polarized or prepolarized microphones extends the frequency range to 70 kHz for high frequency testing. GRAS 45CC Headphone Test Fixture configured with 1/4" externally polarized or prepolarized microphones and the GRAS 44AA Mouth Simulator is for testing of communication headsets. The microphones extends the frequency range to 70 kHz while the mouth simulator has a frequency range of 100 Hz to 16 kHz.